Fred Goguen is the present owner of #261 - Thankful - and he passed on Harry's contact info. Harry bought # 261 in 1998/99 from a man (whose name we are working on) who was a professor at Leheigh University, who reportedly was the original owner, and who sailed her out of Rockville, MD. When Harry got her she was in pretty poor shape and he spent a lot of time in his backyard bringing her back to life. She had a Vire 7 inboard when he had her. He replaced the toe rail and painted her white hull dark blue. 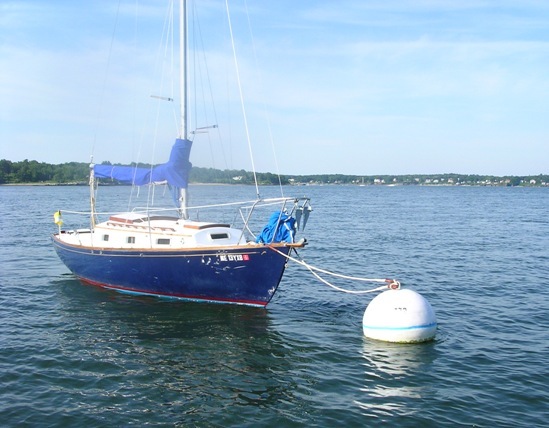 He sailed her on Barnegat Bay out of Spray Beach YC and sold her in 2003 to Andy Hohanssen, who named her Niantic, and also sailed her on Barnegat Bay. When he sanded the transom he could just make out the outlines of the words Grey Seal. Harry joined that select group of Dolphin owners that did not/do not name their boats. We'll try and get some pictures from Harry but until we do we'll use this one of Thankful that your webmaster took from Marionette as we were cruising down east this summer. We are trying to track down the original owner of this boat.. Stay tuned.